Digital marketing is a concept that has engulfed the modern marketing Arena. As to whether it shapes the next marketing platform remains dependent on the extent to which the existing platforms influence the business world. While Google analytics seems to lay the ground for the online marketing, many find it hard to crack the vocabularies involved with the concept. Talks about the same raise discussions and confusions at the equal measure, with the novice crew likely to get lost as soon as the talks arise. For the beginners, the jargon is just too much to grip, but with sufficient training, they find it easy and straightforward to interpret the details. Among the perceived difficult concepts is the bounce rate, which is perhaps the most reported in Google analytics. If you are among those that find it hard to comprehend the phrase, and probably shy away from asking what it is, the following piece gives a thorough idea of what it is, and how you can improve the rate to your benefit. Everyone creates content with the intent to attract readers, gain leads and convert the readers into buyers of the products in the store. But what happens to the percentage that never reads upon clicking the URL to the landing pages? They never get an opportunity to interact with your brands and make a decision based on the online presentation. Every time a visitor views your website and continues to another page, it’s considered an absorbed ball. If he never goes beyond the first page of the website, it’s considered a bounced ball. A bounce is hence considered when online viewers enters the site and leaves after viewing one page. Business analysts will deduce bounce rates from the number of times visitors enter a website on every page as opposed to the people viewing a page they had already seen within the same visit. In case they have seen a given page before and hence deem necessary to bypass without reading, it counts towards the exit rates and not the bounce rates. If you are creating content or designing a website layout, you need to know what keeps readers glued to a page, or even what makes them want to advance their visit to another page. It calls for you to see the industry and create a site and content that resonate with the clientele. Bounce rates might vary depending on the type of content and the page involved. A holding page that lacks links to other pages on a single domain is likely to get 100% bounce rate since the visitors will exit every time they enter the home page. You are likely to find high bounce rates in blogs because they carry the entire post on a single page. The visitors enter the page to get information from the blog and are not likely to click on another page, which counts to a bounce rate. On the other hand, product pages attract low bounce rates since the clients will click through different pages before making a purchase. While the website features and the industry are likely to influence the bounce rates, it often ranges from 40-50%. Anything below 40% is quite attractive while anything above 50% is a sign that your online marketing team needs to work towards fixing the site. Nevertheless, you need to know what contributes to the rates before you can make conclusive inferences, and perhaps analyze parallel data to get a better view of how you are performing. One of the most crucial components of the bounce rate is the average time that visitors spend on the pages. While it could be skewed in Google analytics, it helps to check the time taken before the customers leave the page. The chances are that they could be getting optimal information on the site which often culminates in indirect sales through other channels other than the online site. However, if the readers spend little time on site and coincidentally amount to a high bounce rate, you better sit back with the content team to devise measures to curb the issues. 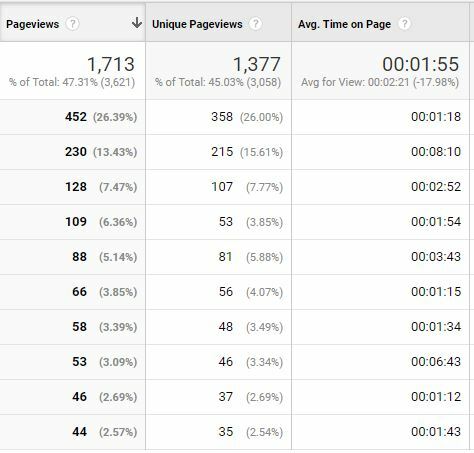 You can get the concrete information from the Top Landing Pages reports below content found in the Google analytics. The feature provides a report on the number of site entrances, bounces as well as the percentage bounce rates. Digital marketing is a concept that requires both proactive and reactive approaches. If you understand the metrics behind your current performance, the chances are that you will act on time before competition moves ahead. Understanding the bounce rates helps you create suitable content, redesign the site, adjust the marketing campaigns as well as improve the selection of the organic keywords.